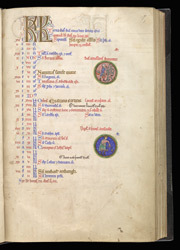 The saints commemorated in the calendar and litany of this Psalter point without doubt to its having been made for an Augustinian house in East Anglia, and this house is very likely to have been Barnwell Priory, on the outskirts of Cambridge. The roundels in September represent the Occupation of the Month, fruit-picking, and the zodiac sign, Libra, the scales. About half-way down the page is an added inscription in black ink recording the death of Ranulf, bishop of Chichester, and about ten lines lower down, another inscription recording the death of Avicia, mother of the precentor of Chichester. It therefore seems certain that the manuscript was owned before 1224 (when Ranulf died) by the precentor of Chichester cathedral.